Puget Sound Media is reporting the sad news that a highly regarded veteran broadcaster of yesteryear has left this mortal coil. Frosty Fowler passed on with his wife Sue at his bedside earlier this week, at age 96. 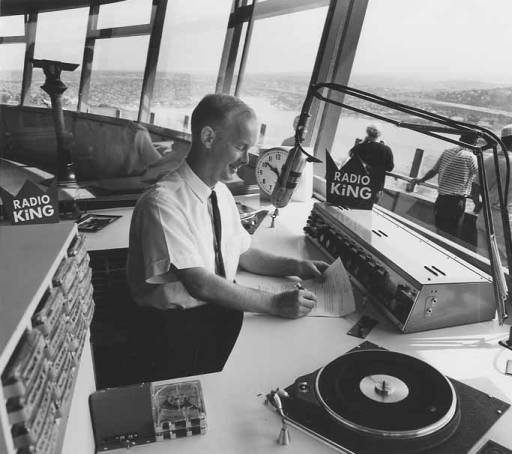 Fowler hosted a morning show in the 1960s on the old KING-1090 AM from a booth on the observation deck of the Space Needle, from which he could watch, and comment on, such sights as rush-hour traffic, ships entering and leaving the port and the huge aerial formation of starlings that would fly toward the Ballard Bridge every morning. “The needle swayed like crazy, but we stayed on the air,” he said, recalling that while internally frightened he tried externally to keep any panic out of his voice. That wasn’t the only harrowing experience in Fowler’s radio career. He broadcast from a painting scaffolding on the Needle, only to have his stay extended when the mechanism overheated and the platform tilted. He did parachute jumps that he recorded; on one of them he wound up in power lines. He took — or endured — glider rides, ostrich rides, handling a boa constrictor and being transferred in a bosun’s chair between ships in the Strait of Juan de Fuca. More than a decade ago Fowler came out of retirement in his 80’s to host a once-a-week show Saturday mornings on Whidbey Island station KWDB-AM (1110) in which he did interviews and related tales of his career in radio. Our thanks to SeattlePI.com for much of the content republished above.